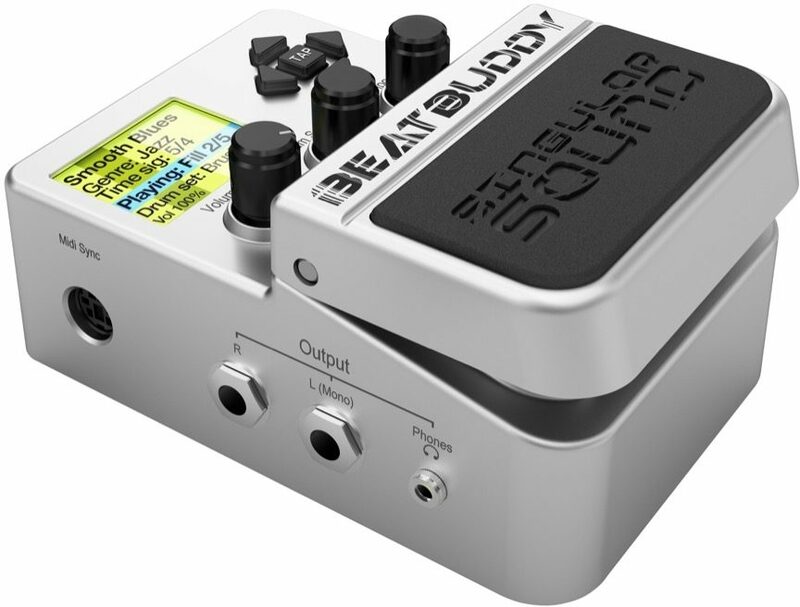 Housed in a humble stompbox, Singular Sound's BeatBuddy pedal has the potential to do something few devices can -- make practice fun. With truly realistic drum samples and an easy-to-follow display, it's an excellent tool for teachers and students. And the BeatBuddy is also a powerful performance companion that can handle improvisations and the unpredictable nature of live music. Choose a style, then add fills, accent hits, and transitions all with your feet through the BeatBuddy's intuitive functions. The LCD display shows each beat, and no matter when you press the pedal, your fills and transitions will always land right on rhythm. Any guitarist who's ever started a band knows that a good drummer is hard to find. With a BeatBuddy in your arsenal, you get the benefits of practicing along with a drummer -- without the hassles, like having to help them load in all that gear. 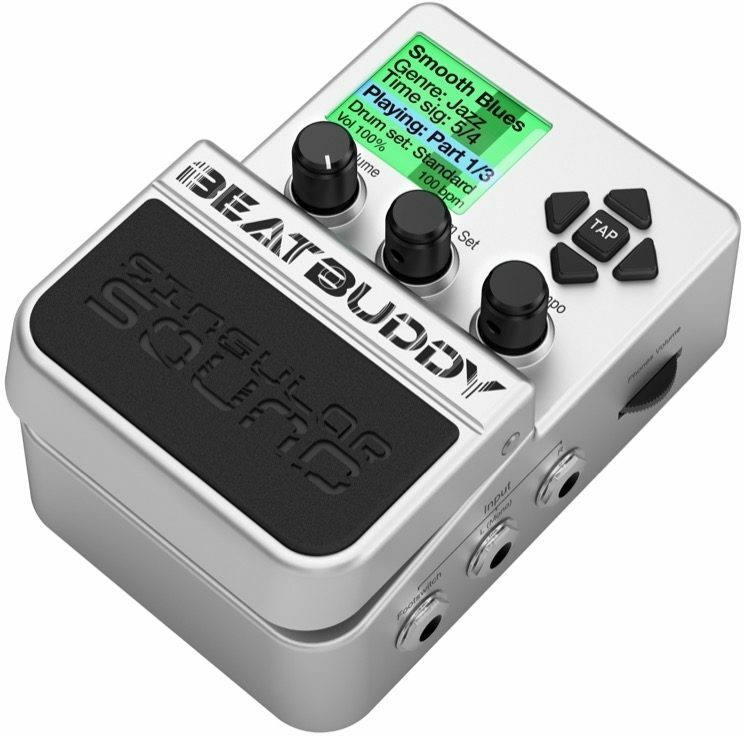 But perhaps most important of all, the BeatBuddy sounds like a drummer -- no sterile, generic-sounding samples here! That's because all of its drum samples were meticulously recorded, with a real drummer on an acoustic kit. When you turn down the volume, you get the sound of softer-hit drums, not the same hit rehashed with lower volume. And if variety is what you need, the BeatBuddy comes pre-loaded with 10 kit types and 200 songs in all sorts of genres, with more content for you to create via software or download from the online BeatBuddy community! The BeatBuddy really is a tool for any level of musician -- its interface is easy to use, but its functionality makes it as advanced as you need it to be. For example, it's easy to keep track of a beat by following the moving bars on the LCD screen, but whether that beat is 4/4, 6/8, or 11/8 is up to you! Likewise, the screen will change colors to identify parts of a song. For example, green is a verse, red is an intro or outro fill, and yellow is a transition fill, for switching between verse styles. Your BeatBuddy includes an SD card preloaded with 10 drum kits and 200 songs that run the gamut from Motown to metal. But what to do if your jazz fusion project calls for something a little more...complex? You can create your own songs with however many parts in however many time signatures, plus customize drum sets with the included BeatBuddy manager software! You can then share your creations or download patches from other BeatBuddy users. Teaching your student rhythm or helping them hone a favorite riff? Take them from the lesson room to the stage with the BeatBuddy's realistic drum sounds. Control fills and drum parts with your feet to coach your student through an entire song. As essential as metronomes are in the practice room, their sterile-sounding clicks just don't make for inspired practice sessions. The BeatBuddy's customizable, realistic drums will add life to your practice and may even inspire new ideas! Need rhythm accompaniment onstage? The BeatBuddy is fully stage-ready, with a pedal design that's familiar to guitarists, bassists, and singers. It's compact enough to bring anywhere, and offers easier on-the-fly tweaks than any standard drum machine. The BeatBuddy footswitch further expands the BeatBuddy's functionality, letting you add accent hits, pause the track, set tap tempo with your foot, or scroll through songs without having to fiddle with knobs. Add a MIDI breakout cable, and the BeatBuddy can sync with other MIDI devices. 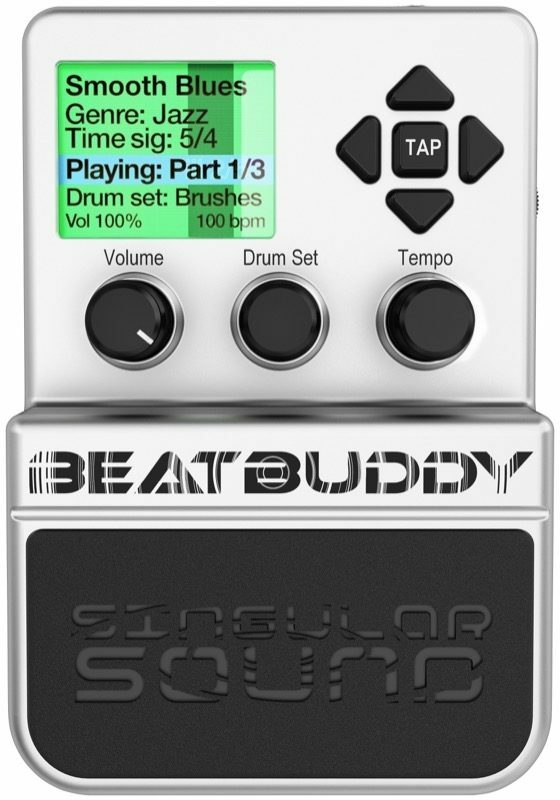 We recommend trying the BeatBuddy with a MIDI-enabled looper to create layered parts driven by realistic percussion. Plan to rock with your BeatBuddy late into the night? The BeatBuddy has a 1/8" headphone output right on the side of it. Of course, it's also got L and R stereo 1/4" outputs, so you can connect it to your guitar amp, powered PA speaker or mixing board. zZounds is an authorized dealer of BeatBuddy products. - Includes: 9V Power supply (500mA, center negative), 4GB SD card, USB cable, Quick Start Guide. - Dimensions: (L x W x H) 5 x 3.3 x 2.5"
- No programming is necessary: Included are ten hyper-realistic drum sets and 200 songs in a wide variety of genres. - For the advanced user, infinitely more songs and drum sets can be created with the included PC/Mac software, downloaded from our ever-expanding online library, or discovered and shared on the BeatBuddy Community Forum. - Featuring a first-of-its-kind visual display of the beat, BeatBuddy also makes it easy to improve rhythm and learn different styles. - It's the power of a drum machine with the simplicity of a pedal. When you think of drum machines, you think one type of sound at a time, with not much on-the-fly usage. The great thing about the BeatBuddy pedal is its ability to add in fills while playing, and even transition to other parts with just a simple tap of the foot. Plus, the BeatBuddy comes loaded with seemingly endless genres and styles of drums. Just when you think you're done checking out all the drums, the included software lets you come up with more. Along with this, you get access to the online BeatBuddy community, where you can share and find more user-created drums. With the pedal's color-changing screen, it's easy to see which part of the song you are in -- keeping you more focused on what you're playing. This pedal brings years of innovation into a portable companion suited for any gigging musician on the go. This review has been selected by our experts as particularly helpful. "Works really really well"
Overall: I was on the waiting list before this was released, and I wanted to wait a bit before commenting. This unit is really great. It's extremely easy to operate. There is a great selection of many, many beats that all sound so real it's almost impossible to believe. Having had both an Alesis SR-16 and SR-18, this thing blows them away. Since it's so easy to change drum kits, I've been playing around with selecting beats I wouldn't normally use as-is, such as some of the hip-hop beats, and assigning them different kits such as "brushes" or "ethereal", and the results are amazing. The timing of the pedal stomps for transitions was a little hard to get the hang of, but I'm to the point now where I can basically "write a song" on the fly and not make any transition mistakes, and I barely glanced at the manual, so it's really not hard. I also have the external footswitch, the official one. I was pleased to see when I plugged it in and configured it, that it did an auto-detection to see if the switch plugged in was latching or non-latching, so in theory you should be able to use any dual footswitch. I play with a "looper" for my guitar, and the stomp-stop/stomp-start is very handy to get back in sync when the looper starts creeping off the drum beat. I have it plugged straight into my studio PA via stereo, and it sounds AMAZING. Can't speak to plugging it inline between guitar and guitar amp. Haven't even begun to play with the software/programming aspect yet, but if it works as advertised I can see how it would be incredibly easy to pre-program your entire set list. The external footswitch, when no beat is playing, is used to cycle through the current group of songs, so it's very easy to advance to the next song in your set list. Also finally realized that, when no beat is playing, the Internal pedal can be used to set bpm by stomping... works really great to set the bpm to whatever i'm feeling, before firing up the song. Love the intros and outros too, makes it very truly "song-like" when I'm performing on the fly. And the 3 randomized fill patterns keep it incredibly "fresh" and not boring. In short: What are you waiting for? If you're looking for a versatile drum machine, this is really the one!!! Style of Music: rock, punk, alt, psychodelia, trip-hop, acid lounge, etc. 19 of 19 people (100%) found this review helpful. Did you? Style of Music: Rock, R&B, blues, etc.